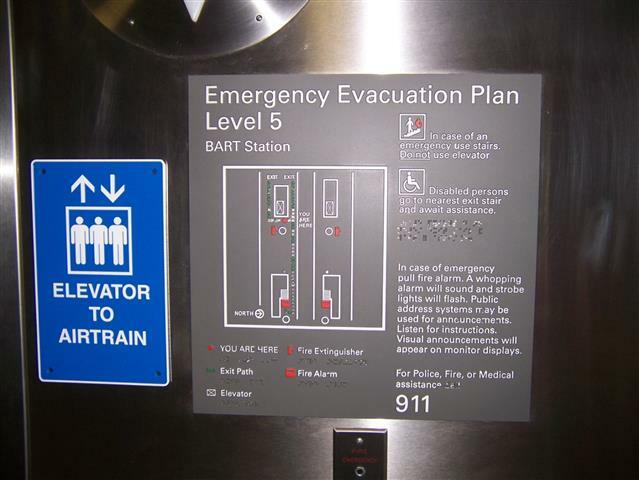 A tactile emergency evacuation plan sign. Information is presented visually and through tactile elements including a map, raised lettering, pictograms and braille. Illuminated exit signage should be used to assist wayfinding, especially where an exit route changes direction or joins another route. All print and tactile signage used to direct people to exit points should be located at exit route junctions and exit points as needed. Emergency exit signage should be located on the right hand side of an exit route. When emergency signage is placed in proximity to a corner, the signage should be located consistent distance from the wall junction. Further information is provided in the signage section.